Kurois asked the question, “What if by engaging our imagination and opening our minds we could unlock the door to a world of wonders?” Hmmm, what if? They say we only use approximately 10% of our brain, and if we were able to tap into more the wonders would never cease. Like the show Limitless where lead actor, Jake McDorman who plays Brian Finch, an average 28-year-old man with the uncanny ability to use his whole brain by taking a drug to solve crimes, was hired by the FBI. The show depicts the amazing things he can do and can remember when he takes this pill and uses his whole brain. Incredible! Anyway back to Kurois, which definitely had my attention. The day I attended the show was an opening day for media, VIP, et al. Kurios treated us well! We were offered free popcorn, water, soda, and red and white wine in plastic wine glasses that you could take home. Talk about good treatment. The staff was nice, efficient and pleasant. Jose Boza of Boza Agency granted me some great seats, making me feel like I was almost in the show. From the beginning to the end of the show I was in awe. I could not take my eyes off the stage. These people were incredible! The juggler was awesome! There were acrobats riding air-borne on an upside down bicycle, wow! Live music! The littlest oldest lady I’ve ever seen was sooo cute! Can you imagine sitting down at a table in the air upside down? How cool! I’ve got to mention the acrobats on the trampoline engaged in a jaw dropping, breathtaking performance. They were crazy good! 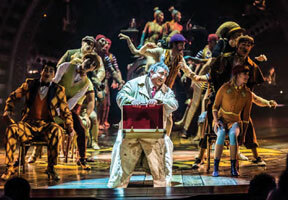 Attendee Roz B said “the acrobats take you to another level.” Amelie Robitile, Publicist, stated that the show is a “feel good, uplifting, and everything is possible” show. A couple who did not want their names mentioned stated, “they don’t speak; it was great, specular.” They were right! I didn’t think of before ,but their dynamic performances spoke for them so that you still understood what was going on. My curiosity was where were the Black people? Don’t get me wrong – there were plenty of Black people working at the show in the concession stands and other service jobs. I was happy to see that but I wondered why were there not any in the show? Are they scared of heights? Some say Black people like to keep their feet on the ground. So, I asked Amelie Robitille, Publicist, that very question. She said it mainly has to do with the writer and how he chooses people for the show. Hmmm, so he doesn’t choose Black people? Maybe that’s not what she meant but I wondered. She did mention that there was one person from Senegal, a country in West Africa, but that person must now be Afro African because I didn’t see anyone with my color. Despite this fact, the show was great! Breathtaking! Spectacular! Awesome! I would recommend that everyone go and see it at least once. It makes one wonder what kind of talent you are sitting on.